Bonds declined, stocks were steady and oil fell on anticipation that the fallout from missile strikes in Syria will be limited. Treasuries dropped with European sovereign debt, the Stocks Europe 600 Index was flat and U.S. equity futures rose as the aftermath of the military action was assessed. Gold, a proxy for haven demand, fell. 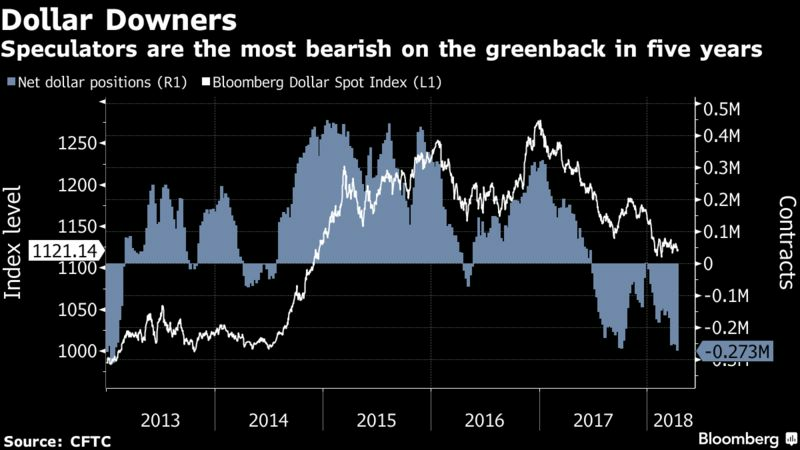 The dollar was steady after CFTC data showed hedge funds are the most bearish on the greenback in five years. The yen edged up as polls showed falling support for Japanese Prime Minister Shinzo Abe’s government. WTI oil futures fell back below $67 a barrel amid concern that production will rise further, and after there was no immediate reprisal to the missile attack. “There was a significant fear of potential escalation; that hasn’t happened so far,” said Callum Henderson, a Eurasia Group managing director in Singapore. Even so, “it remains to be seen how long this market rally lasts on the back of this specific factor — whether or not, or when, Russia retaliates,” he said on Bloomberg Television. U.S. President Donald Trump declared “mission accomplished” via Twitter on Saturday, a day after the U.S., France and the U.K. launched military strikes in response to Syrian leader Bashar al-Assad’s suspected chemical attack on civilians. While geopolitical concerns linger, with new U.S. sanctions on Russia, the focus this week is back on earnings season in the U.S. and a slew of Federal Reserve officials who are due to speak, including the incoming head of the New York Fed, John Williams. Elsewhere, aluminum resumed its rally, adding to what was its biggest weekly increase on record Friday. Russia’s ruble fell on the threat of more sanctions. China GDP and Japanese inflation are the featured data points in Asia. Mining investors will get to take the pulse of the global industry this week, with Vale, Rio Tinto and BHP offering quarterly production reports. The Stoxx Europe 600 Index decreased less than 0.06 percent as of 8:58 a.m. London time. The MSCI All-Country World Index fell less than 0.05 percent. Futures on the S&P 500 Index gained 0.3 percent to the highest in almost four weeks. The U.K.’s FTSE 100 Index dipped 0.1 percent to the lowest in a week. The Bloomberg Dollar Spot Index climbed less than 0.05 percent. The euro increased less than 0.05 percent to $1.2337. The British pound rose 0.1 percent to $1.4247, hitting the strongest in more than 10 weeks. The Japanese yen jumped 0.1 percent to 107.24 per dollar. South Africa’s rand advanced less than 0.05 percent to 12.0712 per dollar. The yield on 10-year Treasuries climbed three basis points to 2.85 percent, the highest in almost four weeks. Britain’s 10-year yield advanced two basis points to 1.455 percent. Germany’s 10-year yield advanced three basis points to 0.55 percent, the highest in almost four weeks. Gold decreased 0.2 percent to $1,342.98 an ounce. West Texas Intermediate crude declined 1.5 percent to $66.37 a barrel, the first retreat in more than a week. LME aluminum increased 1.4 percent to $2,317.00 per metric ton. LME copper advanced 0.2 percent to $6,841.50 per metric ton.